Cody Haroldsen (Ski Utah – Marketstar) won the time trial and held on to win the overall. Photo: Todd Ellis. On Saturday, March 23, riders from Utah, Colorado, and Nevada lined up in the early morning cold to sign in for the first event of the 2013 Tour Del Sol—the Time Trial (TT). The forecast promised a mild day of warmth and sunshine but the sun hadn’t worked its magic yet. Wind chilled, the riders shivered in cold and anticipation as they awaited their turn to heat up the 20K course at St. George’s Southern Parkway. In the women’s 1-2-3 class, Breanne Nalder (DNA Cycling/Plan 7) set a blistering pace, blasting through the course in 31:01.07—11.37 ahead of 2nd place, Devon Gorry (NOW/Novartis), and a full 1:06.05 ahead of 3rd place, Megan Hill (DNA/Plan7)! Burning asphalt seemed to trail Cody Haroldsen (Ski Utah/Marketstar) as he smoked the men’s 1-2-3 TT in 25:37.68! In 2nd, William Buick (Natural Grocers) trailed 57.58 off the pace at 26:35.26 and 3rd place, Renan Maia (Fort Lewis College) finished 1:19.61 behind Cody at 26:57.29. 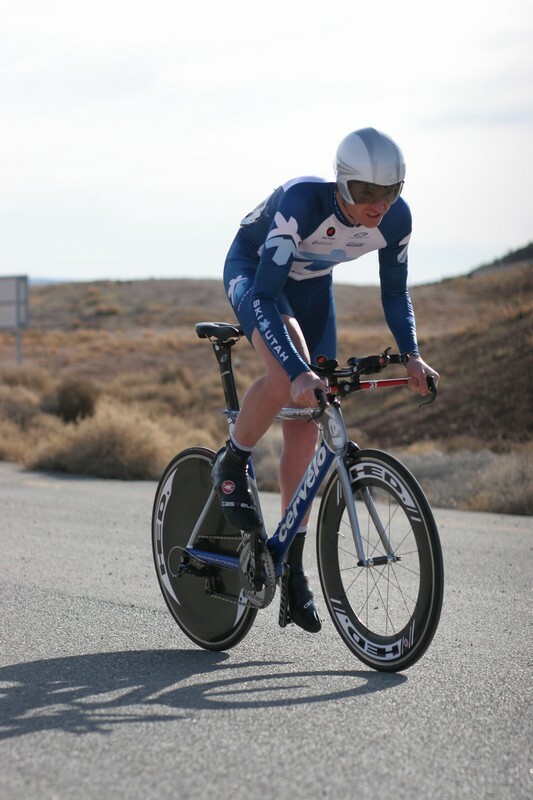 One rider (Gary Porter) went down in the 55+ Masters TT and was rushed to the local hospital. Thankfully his injuries were relatively minor and he was released shortly after. The morning grew steadily warmer as riders finished the TT and moved to the criterium. Crystal skies and a mild breeze greeted them atop the bluff that’s home to the old St. George Airport. Using the old airport for the criterium was a stroke of genius! The 1.2 mile loop is smooth, free of distractions, and catches sunlight all day. One rider even mentioned that both the TT and criterium courses were the best she’d ever raced. Review the criterium results and you’ll quickly realize it was an event for packs. Headwinds forced riders together. A few braved escapes in every heat but like a wolf pack hunting a lone deer, the riders in each class chased down breakaways and ate their lead. The exception was Spencer Derby (Revolution/Café Rio) in the Masters 35+ A 1-2-3. Spencer started pulling away with 2 laps left. He steadily increased his lead and sprinted across the finish 4.0 seconds before the pack! Would that offset his low rank, 24th in the TT? Not by much, but it inspired the competitor in me. 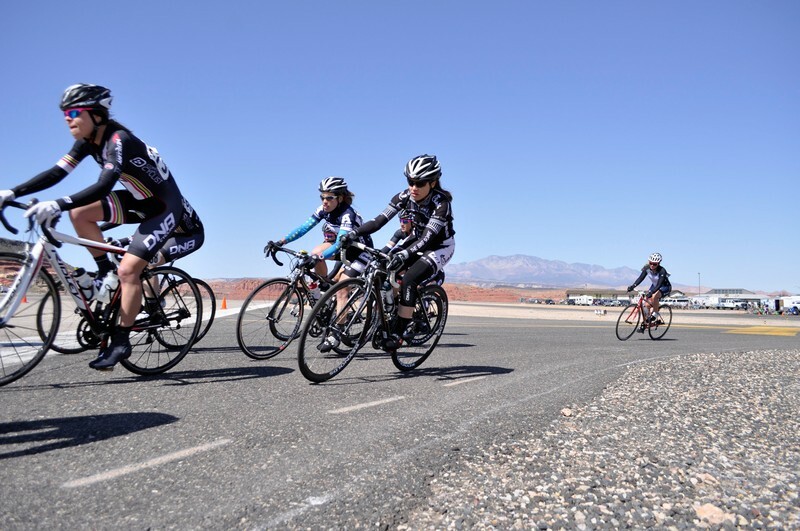 Breanne Nalder (DNA Cycling p/b Plan 7 – far left) won two stages and the overall in the women's Pro/1/3 category. Photo: Todd Ellis. In women’s 1-2-3 criterium (45 minutes); Devon Gorry, Keri Gibson (DNA/Plan 7), and Catherine Kim (DNA/Plan 7) led the charge across the finish with an average speed of 29.589 MPH. In the men’s 1-2-3 criterium (60 minutes); Erick Slack (Canyon Bicycles/Shimano)—who started riding when he was 12—sat straight up in celebration of his win before crossing the finish line. To the uninitiated it seemed he risked losing the crit with such a bold move. But the official film showed he was still a full bike length ahead of Brett Peters (Sonic Boom Racing p/b Lucky Pie) and Hunter Huffman (Canyon Bicycles/Shimano) when his front wheel touched the finish line. When I asked Erick about this, he said he judged his lead by the lengthening shadows and knew he was safe. The road race started at 8:00am in the cold shadows of Utah’s Gunlock Road. Warmth beckoned around the second bend. The pro men 1-2-3, with 80 miles ahead, lined up first. The whistle blew and they were off! The pro women 1-2-3 launched at 8:20am and were quickly bathed in sunlight as they rounded the second corner and disappeared from view. Near tragedy struck in the men’s category 5 road race shortly after their 9:00am start. A 15 cycle pileup marred mile 8 of their 40 mile circuit. According to James Lavelle, the first rider down, a few aggressive riders tried to make an early move. One clipped James’ handlebars and another hit his wheel. He went down and the other 14 dominoed after. One rider suffered a broken collar bone and was transported to the hospital. The rest had bumps, bruises, and road rash. Most of the riders in the accident, including James, dropped out of the race. But one or two managed to finish despite their injuries. At 9:55am a group of three pro men flew past the starting line. The second leg of the road race welcomed them with no competition in sight. At 10:00am the rest of the pro men swarmed past the start like angry hornets in hot pursuit of the enemy. But the hornets never caught their foe. In the end Hunter Huffman, finished the pro men’s road race at 3.41'33” with a grueling 200m uphill sprint to the finish line. Erick Slack and Chris Putt came in 2 and 3 at 3.42'27” and 3.42'33” respectively. Like true champions, Breanne Nalder and Devon Gorry battled each other up the 200m incline to the finish. No quarter was asked or given. They ended the women’s pro road race in a photo finish at 2.09'00”. Breanne barely edged Devon for the win. Lauren Catlin (Ft. Lewis College) crossed for 3rd at 2.09'23”. Over all The Tour Del Sol 2013 was a roaring success!